Today, on Good Morning America, Dan discusses the difficulty in finding an unbiased jury for the Zimmerman Trial. 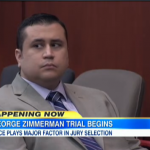 George Zimmerman is facing second-degree murder charges for the murder of Trayvon Martin. Both sides are going to find difficulty in agreeing on a jury. It is speculated that race is going to play a significant role in jury selection. Dan says, “The one issue that no one will admit they’re looking at is race. Both sides will look very closely at race and this is going to be the reverse of what you typically see in a case because here the defense is going to be the one who is going to typically want white male, NRA supporting prospective jurors. The prosecution is going to want the opposite which is unusual to see in a case like this but they’ll be listening very, very closely to the answers, reading these questionnaires really closely to try and see nuances, little things in there about these jurors that they say, you know what, this tells me that this person is this or that.” Watch the full segment here.